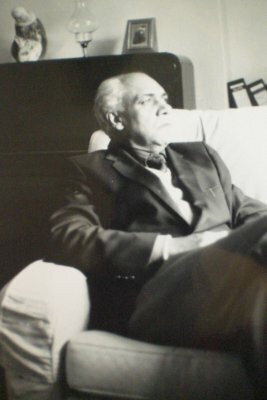 I n 1995 inter-faith pioneer Professor. Syed Hasan Askari (1932-2008) delivers his speech on “Spiritual Humanism” in Hyderabad, India, which would be the last time he visited the city from which he began his career in the 1950s. In his own words he talks about his spiritual journey in three stages: Religious Diversity, Discourse on Soul & Spiritual Humanism as an alternative approach. Musa Askari reflects: How to make Peace? How to be at Peace? How to arrive at Peace? Is Peace the absence of otherness? Inner Peace. The following is the Introduction to a remarkable book by the late Syed Hasan Askari entitled “Alone to Alone – From Awareness to Vision”, published 1991. It is a journey of self-discovery, inner path, a spiritual quest within & through an inter-religious dimension inspired by a vision to revive the classical discourse on Soul. This blog is dedicated to the universal, spiritual humanist vision of Prof. Syed Hasan Askari & contains various reflections from this book which is presented in seven chapters. Each chapter is known as a “Mirror”, there are Seven Mirrors. “You are now entering upon a path. As you continue your journey, you will come face to face with one mirror after another. The path and the mirrors are all inside you. The images you see in each mirror are at times images of a discourse, at other times of one or another symbol. Sometimes a vision will open up before you. Sometimes a voice will be heard. All of it is an initiation into your own reality. There are several straight discourses. Then there are stories. Both the discourses and the stories constitute one fabric. They intersect and interpret one another. At times you may find certain things partly or even completely unintelligible, or vague and abstract. When you will return to them, they will gradually become transparent. You will experience an unbroken sense of inner perception even where you notice that the mirrors are veiled. You are a guest. There is an air of hospitality as you move from vision to vision. It is now both your and my journey into the realm of the Soul. I request you to be cautious for the territory we now enter is totally different from our ordinary world. We shall be changing the habits of our thought and putting on new garments. You will notice the change in atmosphere as soon as you stand before the first mirror. The journey begins in the name of Plotinus. We were invited by him a long time ago to make this ascent. The words, Alone to Alone, are his, and they sum up his entire call. The Lord of the Humming Bird, I am that Tree, The Limit is the Threshold, The Seven Steps, Self Remembering, God is on Both the side, The Are Only Four Communities, The Feet of our Lady, Four Breaths, If You Find Me, Towards Unity, Rebirth Through My Son, Baba Nizamuddin, The Grand Canyon, The Snow The Cloud & The River, Prayer For My Parents, Seven Mirrors. By Hasan Askari (Towards A Spiritual Humanism). By joining both the hands in greeting the other, we greet in all our totality. In our wholeness of being, with our conscious and unconscious minds having become one mind, with our outer and inner realities having risen into one reality. When we greet the universe or a child, we say that our Soul is One Soul, that our God is One. Then we have abolished otherness we have abolished fear, we have all come home in each other. Then we know who we are, who is in us and in whom we are.